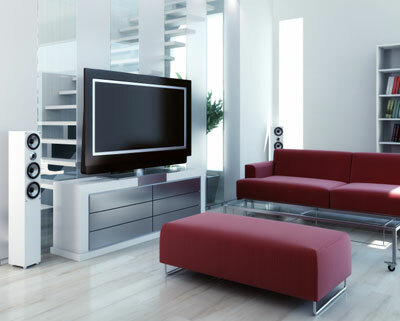 Audio and video equipment for home use comes in a variety of brands and design. 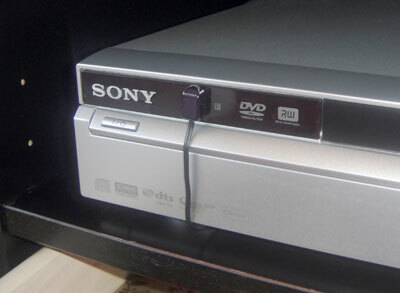 DVD-players, CD-players, pre-, and power-amplifiers, streaming devices, settop boxes etc etc. all take up space below the TV. For many people, these devices are preferably stored out of sight rather than being put on display, and many different A/V furnitures makes that possible. The main problem with hiding away A/V equipment in a closed cabinet, is that they can no longer be remote controlled, since IR remote control units needs a clear "line of sight" to the infrared (IR) receiver in the A/V device. The repeater mode of RE·BL X solves this problem, by repeating the IR signal received by the RE·BL, transmitting it to an IR emitter cable attached to the IR port. To use the RE·BL X, it must first be configured for repeater mode. This is done by connecting it to a PC using a USB cable, and configuring it for repeater mode using the RE·BL X configuration software. Next, place the RE·BL X on top of the A/V rack, and connect a powersupply (DC adaptor or USB power supply), and a single, dual or quad emitter cable to the IR port on the RE·BL X. Attach an IR emitter head to the front panel of each A/V device. Often there's a small IR symbol on the frontpanel to indicate the location of the IR receiver eye, but otherwise you locate it with your remote control unit. The IR emitter head should be attached in close proximity of the IR receiver. Each IR emitter head is held in place by a small piece of adhesive, supplied with the IR emitter. The RE·BL will now re-transmit all received IR commands to the devices placed in the closed A/V rack, while still letting you control your PS3 over the Bluetooth connection. The 'RE·BL X - IR repeater kit' contains everything you need (the RE·BL X unit, DC-adaptor and quad emitter cable), and is available at the wb_webstore.